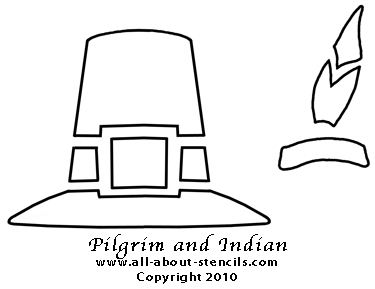 Here are some fun free stencils for your Thanksgiving Crafts! Just right-click on the image and select print. I hope you create some impressive art with these free stenciling patterns. Don’t know what to do with them? No problem! Just look around on this site and you’ll get loads of ideas. Wait! Don’t just print your stencils from this page and leave. You need to check out the Holiday Crafts Section for many more fun projects. To see the Pilgrim Hat and Indian Feather in use click over to Thanksgiving Decorations for great ideas to add a unique touch to the table. Cut-and-paint stencils are less expensive (unless of course they are free like these!). You’re not paying for the manufacture, warehousing and shipping of a product. If you can find down-loadable stencil designs you can have your stencil immediately and no delay to your project. Here we offer some free stencils to get you started and a few in book format of our more complex designs. Do you want to see our catalog? Hop over to our Stencils Page. Did you like these Thanksgiving Crafts and Ideas? Want more Free Printable Stencils? No problem! You'll find more at Free Stenciling Patterns (including a 2-Layer Fleur de lis Stencil). But that’s not all. Keep browsing around the site and you’ll find free stencils galore (like the Free Christmas Stencils)! You can’t beat these free Thanksgiving Crafts stencils! I hope they have inspired you to get started right away making art with stencils. And hey! Don’t forget that I (and everyone else) want to see what you have done with your free Thanksgiving Crafts stencils or any of your stenciling art. Just click on Stenciling Projects to get your masterpiece showcased here on this web site. Won’t that be exciting! Or if you have any questions or want to share information join in on the Stencil Blog. Well, I hope to hear from you soon. 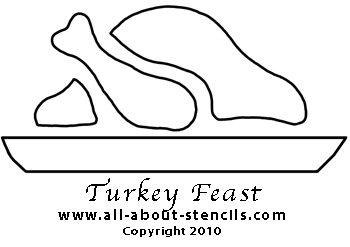 Return to Home Page from Free Thanksgiving Crafts Stencils. Return to Free Stencils from Free Thanksgiving Crafts Stencils.